Despite becoming a member back in 2014, it was not until last week that I was first able to fish any of the club waters for the first time. Living nearly 250 miles away in Cheshire does not really help but, as an introduction to the fantastic fishing the club has to offer, I could not have wished for a better couple of days long trotting on the Lower Water last Thursday and Friday. The conditions weren’t helpful when I arrived rather later than I expected, being wet on Thursday (and wet and windy on Friday) but I met two members on my way upstream and chatting to them about the fishing and learning that the grayling seemed to be in a receptive frame of mind soon dispelled any misgivings I may have had. I had walked the bank, spotting fish, in mid-October and despite the river now carrying more water, this served me well especially as I only had two hours fishing before it got dark ! After losing a big grayling, I soon had two fish each over two pounds. I then moved and had two more fish again over two pounds with the bigger of the two weighing 2lb 10oz (equalling my previous biggest ever fish). The following day, the wind made fishing quite difficult, and although I started at 8:30am, by 2:15pm I hadn’t contacted a single grayling. Then just as happened the day before, I lost a big fish but soon after landed another over 2lb. I moved and had a nice fish of 2lb 8oz. John Aplin told me he would try to come down to meet me for a chat and just before he arrived I hooked and lost a truly huge brown trout at the net. I would estimate it was nearer 4lb than 3lb. I couldn’t easily net it due to its size and it levered off the net frame and shot off directly across the river breaking my line near the hook. After taking a grayling of around a pound (which rather broke my run !) it was too dark to carry on and I had a long, tiring but very happy drive back up to Cheshire. 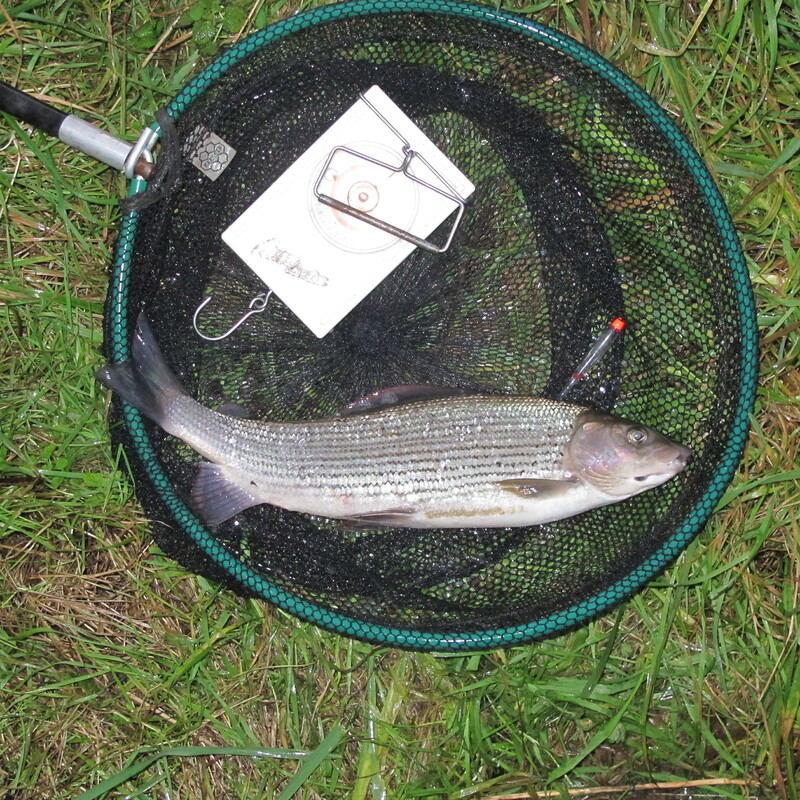 It occurred to me on the journey home that over two days I caught six consecutive grayling over 2lbs…unprecedented fishing for me and unlikely to be bettered without a considerable slice of good fortune. Needless to say I can’t wait to come back down again…and hopefully before Christmas !